Casement windows are easy to recognize. Most are vertical rectangles that have a single pane of glass. They also tend to have simple styling that sets them apart from more decorative window types, such as traditional divided-lite single- or double-hung windows. But perhaps the most distinguishing feature of a casement window is its operation: Instead of sliding up and down (like hung windows) or side to side (like sliders), casements are hinged at the side, and they open outward (like car doors) by means of a mechanical crank. In rare instances, a casement may pivot inward, into the room. 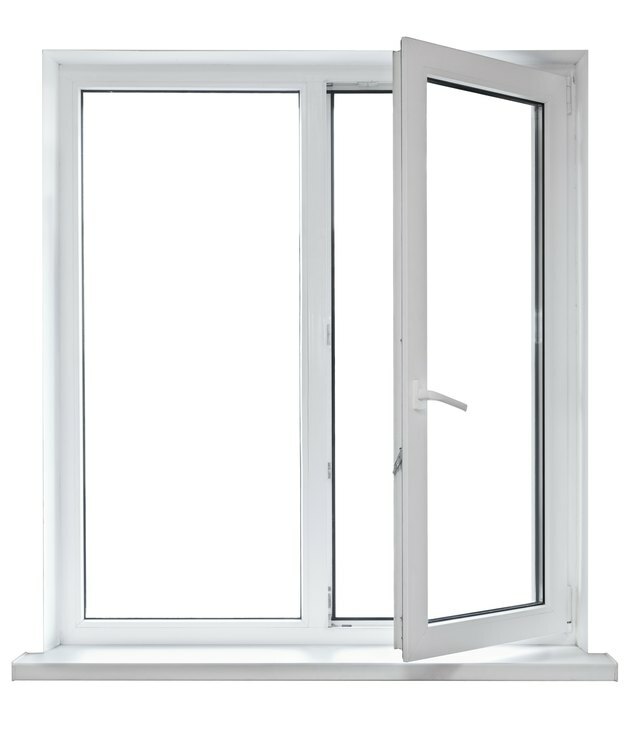 In this style, the window is usually operated by a simple locking handle rather than a crank. Casement windows pivot from hinges mounted along one vertical edge. While historic homes and contemporary houses with traditional styling favor the classic look of single- and double-hung windows, casements offer a more streamlined, modern aesthetic. You find them used in all sorts of modern home styles, from postwar rambler to mountain contemporary to ultra-modern box. Casements can have divided panes, usually provided by a faux muntin grid applied over a single pane of glass, but they're most effective with wide-open glass that provides an unobstructed view. By contrast, single- and double-hung windows always have a sash frame cutting through the center of your view. If you want to maximize the glass and still have a window that opens (not a picture window), a casement is the way to go. Another advantage of casement windows is the amount of clear opening they provide relative to the overall size of the window. For a window to qualify as an emergency egress/rescue opening (required for bedrooms and basements), it must have at least 5.7 square feet of unobstructed opening (or 5 square feet for ground-floor windows). 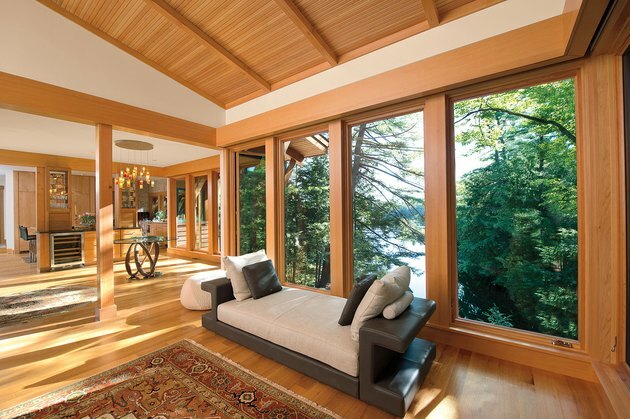 This can be achieved with a casement window that has an overall size of just 8 square feet. Compare that to a double-hung or slider window, which must be around 15 square feet to offer a sufficient clear opening. 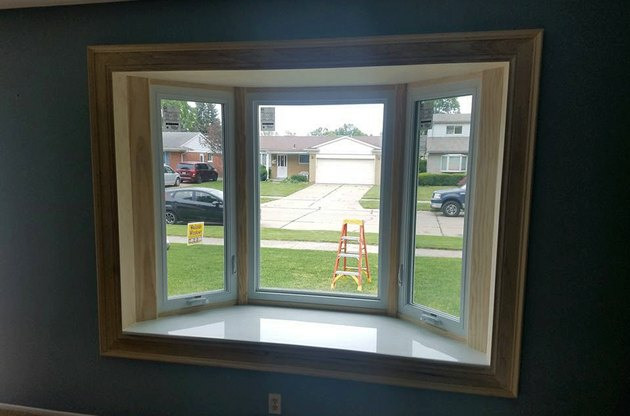 The vertical orientation of most casements makes it easy for them to meet the minimum height requirements of 24 inches; the minimum width is 20 inches. A typical casement window has two or more hinges along one long side. These work just like door hinges and allow for very easy movement. At the bottom of the window is a crank mechanism with gears and a winding handle. The mechanism controls a pivoting arm, at the end of which is a plastic disc that slides along a metal track on the bottom of the window sash, pushing the window open or pulling it closed as you turn the handle. Casements also include one or more locks. Simple versions have a curved handle that pivots up and down and includes a curved hook that secures onto a catch on the window sash. More elaborate locks have handles that control deadbolts at the top and bottom of the sash. Bay windows commonly have a center picture (fixed) window flanked by two casements. Some old casement windows are "push-out," meaning they don't have cranks. Instead, you open the window just by pushing on it. You then prop the window open with a pivoting bar that is fixed to the sash and has notches or holes to secure the bar onto a little pin sticking up from the window frame. These basic windows have an Old World feel (and that's where you're most likely to see them). Casement windows can be made with all the standard framing materials, including wood, vinyl, steel, aluminum and fiberglass. And like any window type, casements can be glazed with a variety of glass options, ranging from single-pane glass to high-efficiency thermal panes with triple layers of glass and inert gas filling the spaces between panes. Not surprisingly, almost all maintenance problems of casement windows are related to the crank mechanism and the sliding arm and track. The track and the gears get gunked up with dirt and old lubricant, making the window hard to open or close. The pivoting arm loosens with use, as can the gears and the entire mechanism's mount to the window. Usually, a quick cleaning and tightening of parts gets the window back in shape. A common cause of bigger repairs is stripped gears or stripped teeth on the crank handle. The handles are removable, and as they get loose over time, they chew up the teeth on the little stub axle on the mechanism, where the handle connects. When this happens, or when the gears strip, the standard repair is to replace the entire mechanism. Pivot arms can be separated from the sash track for cleaning and repairs. To get the best energy performance from casement windows, it's important that the weatherstripping is in good condition and the sash locks securely. This means the lock must be properly aligned with the closed sash. 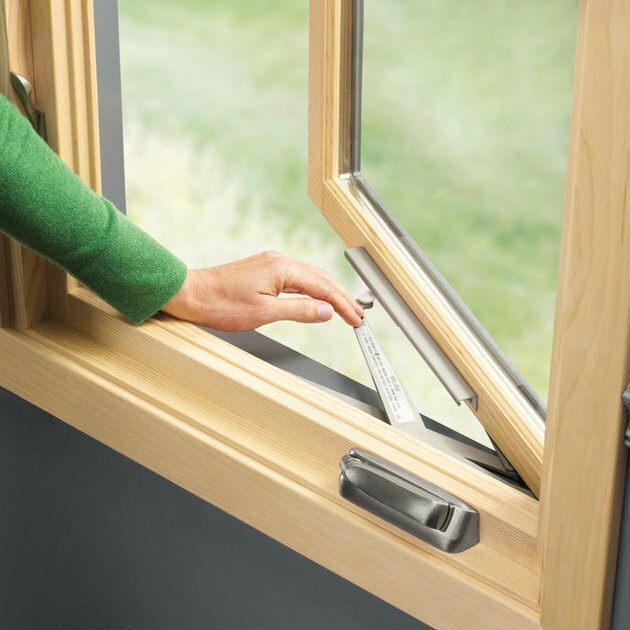 The lock is key to the airtightness of the window because it pulls in the window so it compresses the weatherstripping. If you merely close a casement window and fail to lock it, chances are it will leak air like crazy, especially if it's an older window. What Is the Difference Between a Cafe Curtain Rod & Regular Curtain Rod?